^ Norwood, Robyn (October 21, 2004). "Mighty Ducks Hire Ferreira as General Manager". Los Angeles Times. Retrieved May 1, 2014. ^ "Mighty Ducks fire Ron Wilson as coach". Canoe.ca. May 20, 1997. Retrieved May 1, 2014. ^ Norwood, Robyn (May 30, 1991). 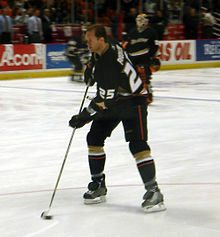 "Ducks Are Already Defensive : Hockey: Goalies Hebert and Healy are first players taken by Anaheim in expansion draft". Los Angeles Times. Retrieved May 1, 2014. 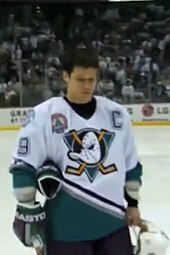 ^ "Former NHL player Paul Kariya announces retirement after post-concussion symptoms". ESPN. June 29, 2011. Retrieved May 1, 2014. ^ Penner, Mike (January 2, 1994). "1993: The Year in Review. 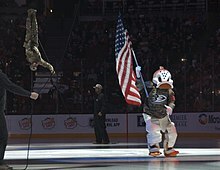 The Mighty Ducks Steal the Show : Ducks: Diamond in a Rough Year". Los Angeles Times. Retrieved May 1, 2014. ^ Norwood, Robyn (August 16, 1996). "THE NHL : Epilogue : The Kings and Mighty Ducks Have at Least One Thing in Common-They Are Two of the 10 Teams That Managed Not to Qualify for the Stanley Cup Playoffs. Yet the Assessment of Their Seasons Says a Lot About the Teams-One That Surpasses All Expectations, and Another That Lived Up to None. 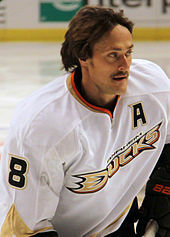 : MIGHTY DUCKS : They Had to Climb a Matterhorn, but They Were a Real NHL Team". Los Angeles Times. Retrieved May 1, 2014. ^ LARRY LEBOWITZ Business (March 16, 1997). "The Wide (disney) World of Sports". Sun-Sentinel. Retrieved May 1, 2014. ^ "Mighty Ducks fire Ron Wilson as coach". Canoe.ca. May 20, 1997. Retrieved September 27, 2016. ^ Jack Thompson (June 16, 1998). "Mighty Ducks Change Again, Fire Coach Page After 1 Season – tribunedigital-chicagotribune". Chicago Tribune. Retrieved September 27, 2016. ^ "Ducks' Failure to Pick Up the Pace Led to a Stumble – latimes". Los Angeles Times. April 10, 2000. Retrieved September 27, 2016. ^ "Ducks history and fun facts". Ocregister.com. Retrieved September 27, 2016. ^ "Name change set for Mighty Ducks". Ocregister.com. Retrieved September 27, 2016. ^ "O.C. colors Ducks' new look". Ocregister.com. Retrieved September 27, 2016. ^ "Off-ice official Laing balances hockey with police work". National Hockey League. April 20, 2007. Retrieved September 27, 2016. ^ Greg Beacham (January 17, 2014). 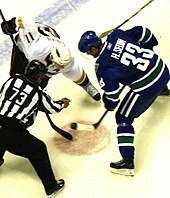 "Ducks soar to top of NHL with 18 wins in 19 games". Yahoo!. Retrieved September 27, 2016. ^ Ducks, Anaheim (June 27, 2014). "Ducks Acquire Ryan Kesler". Anaheim Ducks. Retrieved June 27, 2014. ^ "Ducks' mental will is lacking in another Game 7 loss". Los Angeles Times. May 30, 2015. ISSN 0458-3035. Retrieved June 2, 2015. ^ "Ryan Kesler signs six-year contract extension with Anaheim Ducks". Retrieved July 17, 2015. ^ Halford, Mike (December 12, 2015). "Getzlaf rips his team for lack of professionalism – ProHockeyTalk". Nhl.nbcsports.com. Retrieved September 27, 2016. 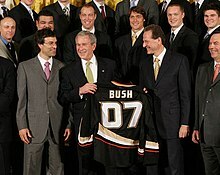 ^ "Ducks to wear third jerseys in 2010-11". Ocregister.com. Retrieved September 27, 2016. ^ "Ducks Unveil 2014 Coors Light Stadium Series™ Jersey for Dodger Stadium Contest on Jan. 25 vs. Kings – Anaheim Ducks". National Hockey League. Retrieved May 1, 2014. ^ "Mallard nests at The Pond". Ocregister.com. Retrieved September 27, 2016.